While on holiday in France, Daniel and I were looking for motorcycles to hire but we never found any. We were told by one business that new insurance changes had made the business unviable. It's too bad I hadn't discovered Ride The World before we went on holiday as they list a few companies still renting bikes there. 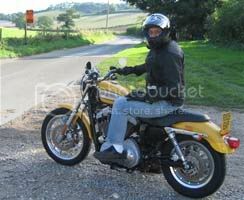 Anyway, we managed to rent some Harley's yesterday just before Daniel headed back to Canada. 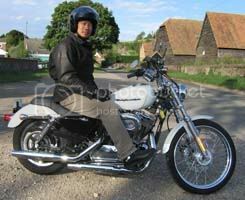 Both bikes were 1200cc Sportsters rented from Thames Valley Harley-Davidson for £69. For me, this was my first ride after getting my motorcycle license seven months ago and by far the biggest bike I had ever ridden. I was a bit nervous but at some point you just have to get out and do it. It was a perfect warm sunny and dry day to go for a ride. We skirted around south of Oxford and rode around the Cotswolds. Fabulous open windy roads out there. By the time we headed home through the Chilterns, I was much more relaxed and enjoying the ride. My hands stopped being numb from gripping the handles so hard! Altogether we covered 185 miles. The Harley was really easy to ride. For such a big bike, it's not at all twitchy. The power comes on smooth and slowly and just keep coming on as much as you want. No big jolt of power. It definitely prefers to rumble along at low revs. The sound is terrific as you go down narrow streets between buildings on a high street. After a pub dinner, we rode home at night which was not fun. With oncoming cars, you're obliged to use a low beam and if there's no street lighting, it's really hard to see what the next corner is like or where the road is turning! Freaky. We returned the bikes this morning after going for another short ride. Definitely felt good swinging around the bends on the local backroads on a crisp sunny morning. I really should get myself some proper biking gear. I wouldn't mind trying out some of their other Harley's too! While hunting for bike rentals in the UK, I also discovered Raceways in London. They look like a great place to hire a bike for the weekend.